Experience life, as a doctor, in the world's largest city! China is the world's most populous country and currently has the fastest growing economy on the planet. As wealthier Chinese, and the ever expanding ex-pat population seek improved healthcare services, our client is growing significantly over the next few years to meet this demand. You will be joining an established private hospital in a healthcare company, that was established 20 years ago. If you are seeking a new challenge and would like the opportunity to fast-track your career in an emerging market, please do get in touch. You will be joining a brand new hospital for the group, in Shanghai. Salaries are generous and offer a host of employee benefits - 140,000 - 150,000 UK Pounds equivalent is realistic! Often referred to as the ‘New York’ of Asia, Shangai is the world’s largest city and has an ever growing population of around 24 Million residents. As China is opening up to the world, Shanghai is among the chief beneficiaries and in 2016 it was named the most attractive city for expats (for the fourth time in six years) by International Talent Magazine. Shanghai is home to over 170,000 expats as of 2015. 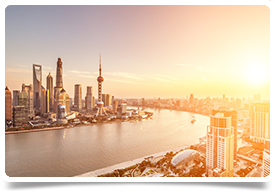 Shanghai Boasts fantastic downtown nightlife and Night Lights and as the world's fastest growing city, Shanghai is no stranger to world-class clubbing and pubbing. On the other side of that, if you are relocating with your family, the first thing ex-pat parents will tell you is that Shanghai is an extremely safe environment. Chinese people love children and will go to great lengths to entertain and spoil your youngsters at any given opportunity (which can be a little overwhelming and strange at first). With inexpensive domestic help, you will also find yourself, instead of being loaded down with chores, you are able to spend more quality time with your children, taking them swimming, or to the park, or to one of Shanghai's amazing museums. Eating out is also notably more enjoyable with children in Shanhgai as children are welcome everywhere – even in high end restaurants and many also have child-friendly facilities.